I am definitely a classic type of girl when it comes to fashion. Even though I love incorporating bold colors to my outfits lately, I still feel comfortable wearing my neutrals. For me, adding bold accessories is the best way to dress up my plain outfits. With that in mind, I picked out this Patty Shoulder Bag when Aftershock London reached out for a mention. Cross-body satchels are everywhere this Fall and I can totally see why. It is very practical and also trendy/chic at the same time. I know I can’t afford a Hermes Berkin so this one will do for now. If wool pants, button-down shirt and black pumps does not scream classic, I don’t know what does? A pop of blue (or periwinkle?) will certainly spice up a plain outfit. If you’re interested in this satchel, here is your chance to win one. Aftershock London agreed to give away this exact same bag ($100.00 value) to one lucky winner of PetiteLittleGirl.com. (CLOSED) All you have to do is subscribe to their mailing list. You DO NOT need to follow my blog to enter. However, I'd greatly appreciate if you do. Their goal is to collect 500 emails over the course of 8 weeks (whichever comes first). Once they reached their goal, they will draw the winner (sorry guys, I do not make up these rules). Note: Giveaway open to U.S, U.K and Canadian readers only. If the winner resides in the U.K or in the U.S, Aftershock will send the bag to the winner from London. If the winner resides in Canada, I will personally forward the prize to the winner. How cute are you?! This is a great number. Love that bag! I always find it fascinating how foreign companies want to partner up with you! I just checked out their site and it is a British company? Swwwon! I love British clothing and designers, and recently purchased the Pippa bag from Modalu. I'll look at the site more tonight, and I've included my email address because I am excited to get their newsletter! I agree that classic is always best and I love your pieces. The satchel is gorgeous. Do you know if it's leather and what the interior is made of? sydney-- i totally know what you mean by going with neutrals. i feel comfortable in it and its much easier to wear without having to think about it. you look great in this outfit. Good God you look good. Perfect outfit. Love your bag too. You seem to be a hit with the foreign companies and I like that :) they have different things to offer. Perfect outfit! @R.L. Hi R.L! It's not real leather and the interior is made of canvas. Hope that helps! Such a casual chic look! The cobalt is a great pop of color for the outfit. Ooh, I love that color! Bold bags are my favorite, but I don't have a blue one yet. This is definitely a classic look! I love to go for classics as well. It's amazing what you can do with a simple white button up shirt. You put it all together perfectly!! :) Love it!!! This is one of my favorite looks you've ever posted. You're gorgeous! @Bravoe Runway Bessie, the company based in London. It’s such a nice change to see different designs now and then. Thank you so much for entering. What a gorgeous bag - it looks fabulous with your ensemble! 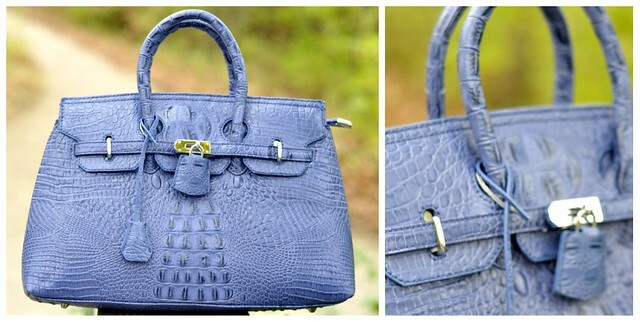 I don't know that I will ever own a Birkin but I do love the look of one.